Tile flooring in Castle Rock, Littleton & Colorado Springs, CO from Colorado Carpet & Flooring, Inc.
Colorado Carpet & Flooring offers a wide variety of tile options to people of South Denver and Colorado Springs. Options vary based on what the overall situation is. There are numerous types of tile flooring. The most common tile used in South Denver and Colorado Springs are ceramic, stone, porcelain, granite, mosaic, travertine, Saltillo, and slate. Tile flooring is popular in homes and businesses in South Denver and Colorado Springs. Tile floors are easy to care for and easily customized to fit your needs and match the decor of the room. There are several things to think about when you are deciding whether tile flooring is an appropriate choice for your space. 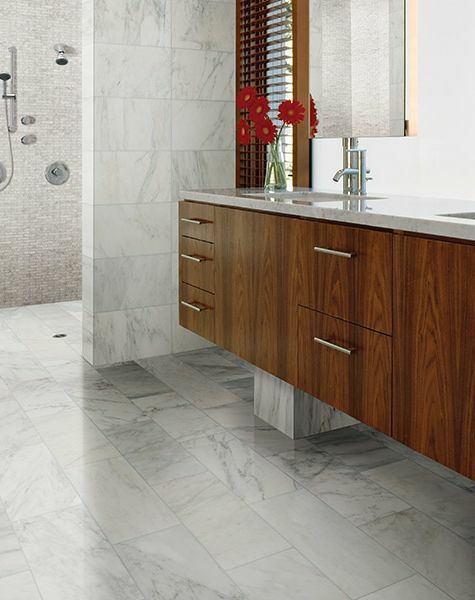 Tile flooring can instantly transform the look of any space. Adding accent tiles or creating your own tile pattern allows you to personalize the floor tiles. To further personalize the space, you can add rugs on top of the tiles. You can also change the accent tiles fairly easily by removing single tiles and replacing them with new ones. Because of these options, floor tiles are ideal for a person who likes to change the look of a room often. Floor tiles have a rating system that ranges from I, or light duty, to V, or extra heavy duty. This rating should be the first thing you look at when choosing tiles. Next, you should pay attention to the porosity level. Tiles are classified from non-vitreous, or water absorbing, to impervious, or water resistant. Tiles that are used in a bathroom or kitchen, for example, should be impervious. Finally, you should consider the firing method. Tiles that are double fired are thicker, which makes them stronger. Bisque tiles and single-fired tiles are thin and break easier than double-fired tiles. There are numerous types of tile flooring. Travertine, ceramic, stone, marble and porcelain are the most common. Each type of tile flooring is available in a varied selection of shapes, sizes, colors and patterns. When you decide on the type of tile flooring you want to put in your home or business, take the overall decor and use of the room into account. Marble tile floors, for example, scratch easily and are a less than ideal option for a busy room or child's room. Tile flooring is an appropriate option for people who have allergies. The main cause of allergies that are triggered indoors is the allergens that are in the house. It is easy to clean tile flooring to remove the allergens. All you have to do is sweep and mop. Carpeting, on the other hand, is difficult to clean properly to get allergens out of the carpet and carpet pad. Tile flooring is hard and often slippery. As such, this type of flooring is less than ideal for children and elderly people. That isn't to say that tile flooring should be avoided in these areas. Some floor tiles have special additives that make the tile slip resistant, even if it is wet. In some cases, you may be able to wax the tiles with the additive yourself if the style you like isn't available in a slip-resistant model.